Blueberry pancakes, blueberry muffins, blueberry cobbler, blueberry cheesecakes, all are yummmm…but my favorite way to eat blueberries is by the handful, fresh picked off the bush, all warmed by the early morning sun. I have to practice self-control when I am in the field picking or my stomach would be the only bucket that got filled. The tastiest blueberries are from a farm that a friend of mine manages. When she needs help on busy weekends at the pick-your-own field, I will work in exchange for free blueberries. Thankfully, she has lots of busy weekends this time of year. Most of the blueberries in my plastic bucket will be frozen and used to make a special award winning sour cream blueberry concoction that I will place in baskets and deliver to various individuals that need the encouragement that can come in the shape of a muffin. Those blueberry hugs that I am privileged to deliver have their origin in many, many hearts. 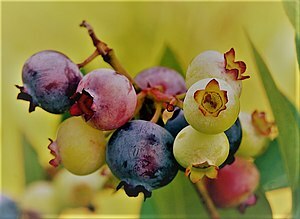 The Good Gardener conceived the wonder and delight of blueberries, sunshine to warm them, soil to nourish them, and water to plump them. The owner of the farm blesses my friends by splitting proceeds of the u-pick field with them in exchange for their work overseeing the blueberry season. My friends bless me by giving me the opportunity to work for blueberries. The Darling works hard at two jobs to bless our family by providing for our many needs and for the grocery items that must be added to the blueberries to make muffin hugs. So when I deliver a blueberry muffin of encouragement and the person smiles in thanks, I know it’s not my thank you to keep. That smile of appreciation has a long way to travel, and many stops to make along the way. I am only a reaper of great deeds that others have sown and what others have grown. It’s good to remember that this reaper is just the laborer. I hope that one day I will automatically recognize that fact in every other area where I receive thanks. This entry was posted in CC Posts and tagged Big Blueberry Muffins, Blueberries, Blueberry, blueberry muffins, Christianity, faith, Fruits and Vegetables, labors of love, Muffin, picking blueberries. Bookmark the permalink. Yummy! I wish I was close enough to sample that tasty muffin! Great work! Thank you for your comment of encouragement, it was very special to hear that you had a favorite part. Blessings.